My apartment as I know it has become something drastically different. We have been craving more space. In everyway. We needed storage, display space, and general floor space. So, we did away with our "focal wall" if you will, and put in a wall of shelving. a little bit more of a design challenged that a highly styled console table, I still want to make it a focal point, while keeping the living room polished, but opening it up..
but, M isn't sold. 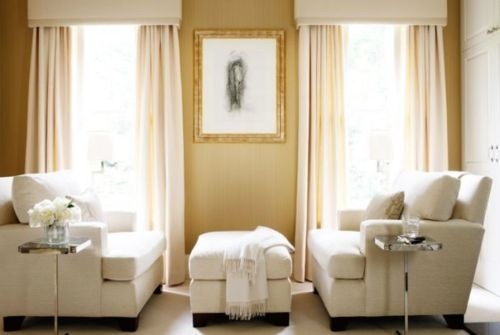 Do you have chairs in your living room? Do you feel they give openness, while still maintaining ultimate comfort? ahh! My perfect living room would be a couch and two chairs like the last photo but the hubby won the battle with a modern style sectional... btw, I love the built-ins in the first image. Gorgeous! We wouldn't give up our large couch without a major fight. That's because its the only place where one of us can sleep if the other one is coughing up a storm. yes, yes, yes on the chairs! my husband and i moved out of a home built in 1921 and our living room was a long rectangle. we had 1 big couch and 2 chairs because we couldn't fit the sectional that we wanted. we've since moved into a brand new home and got rid of the couch, bought a sectional and now i have my 2 chairs in a little seating area off the breakfast nook, but it's still in the living room. honestly, we hardly sit in them and we will drag them over to the tv if we have company and need more seating. but it really helps to break up the room and seem like there's more space than there is. i'm sure you 2 will mostly sit on the couch and no one's going to complain if they have to sit in some pretty, comfy chairs. i say just do it and he will be happy once he sees the result. As a guy I understand what your hubby is saying you want ultimate comfort. We want to lounge and be able to throw our feet up and watch a movie. You can bring them out to watch a movie with guests and lounge your feet up or place trays on them and serve food or you can put them on the side if you need the space. It works like a charm in my apartment. I got two brown and white Ikat ones that go perfect with my orange suede couch and white chairs. When I'm not using them they are on the side of my couch and the texture and color adds to the room. I think that if you use the room a lot, you have to be a little bit practical and think of how you're most comfortable watching tv and hanging out. If it's your only living space, I think you'd miss a couch when you want to cuddle with your guy or when friends come over and you only have two cushy chairs. We opted for an L-shaped couch and it's worked really well since the floor space stays open for the most part. Good luck deciding - it's hard in a shared space! I love the flexibility of two (comfortable, stylish) chairs and really most people don't like to sit right next to each other on a couch anyway - they want to face each other! So, I think this would be a great choice! Those bookshelves are amazing! 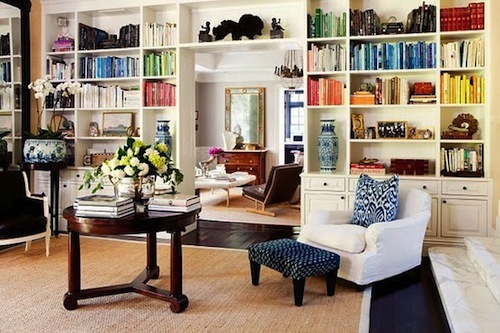 The first picture makes me want to go organize my books by color right now! I think some nice comfy chairs are the perfect solution! Try choosing chairs with a lower back and a more narrow arm. I know sometimes clients don't realize that an arm of a piece can take up a ton of space. Good Luck with it, can't wait to see how it turns out!